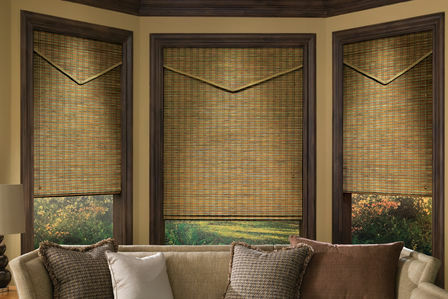 Provenance® Woven Wood Shades by Hunter Douglas Window Fashions add a warm, rich dimension to any room. Hand-woven from light-filtering reeds, grasses and woods, they are available in a variety of opacity levels including sheer to opaque, light-filtering or room-darkening. Provenance Shades are available in five distinctive shade styles including Standard Roman, Classic Roman, Hobbled Roman, Roller or Vertical Drapery. In addition, shades can be customized further by adding options such as edge banding, privacy liners, top treatments and other design options. Distinctive natural beauty complements any room.